IT WAS a stunning afternoon at Amamoor and the wedding guests gathered around the hibiscus tree where the happy couple loved to play and pee. The bride - a dachshund - positively glowed in the stunning white frock with baby blue and pale pink trim borrowed from her "mother's" doll. The groom looked like a hound dog in his dashing jacket and bow tie - except he was not a hound dog; he was a fox terrier chihuahua cross. The wedding took place at the mother of the bride's grandparents' property, the happy couple's favourite place to romp. It was a doggy wedding. Yes, it was an arranged marriage; but one where love and destiny were in the air. 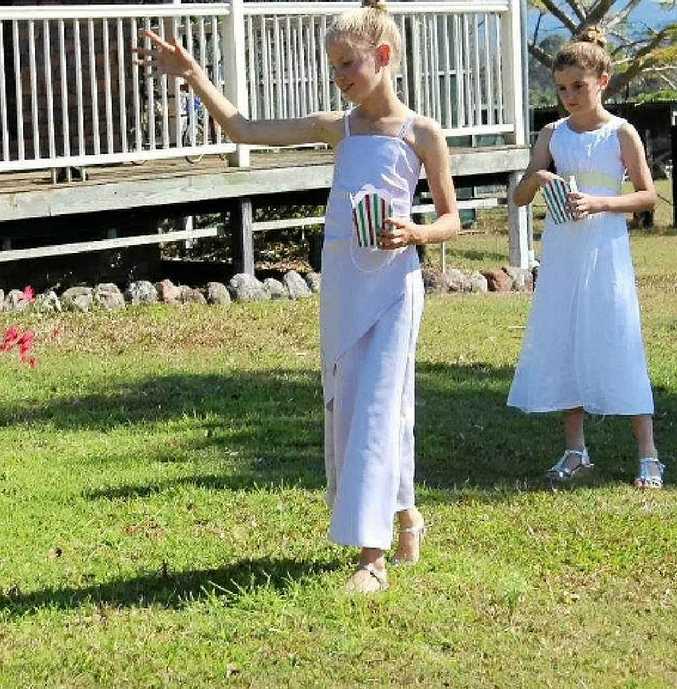 The two flower girls threw petals in front of the bridal couple - Bella and Archie - as they made their way to the altar, where the celebrant, dressed in footy shorts and a Devil's shirt, waited to conduct the ceremony. Bella and Archie - though different breeds who hailed from different parts of the region - had both been born on the same day in November. It was a sign. 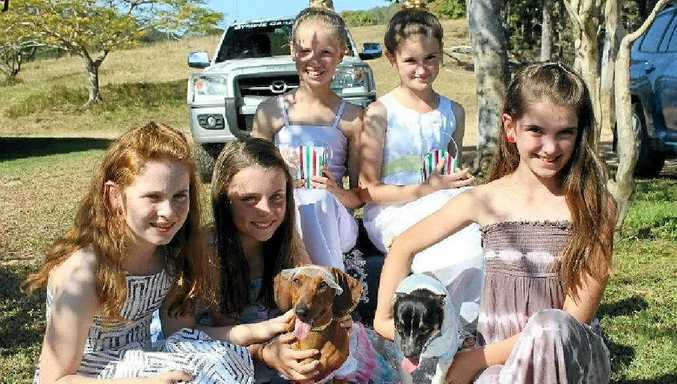 THE WEDDING PARTY: (From left) bridesmaid Ivy Dugdale, mother of the bride Lara Urwin and bride Bella, flowergirls Allie Salter and Lily Bromilow, groom Archie and bridesmaid Lillie Crumblin. 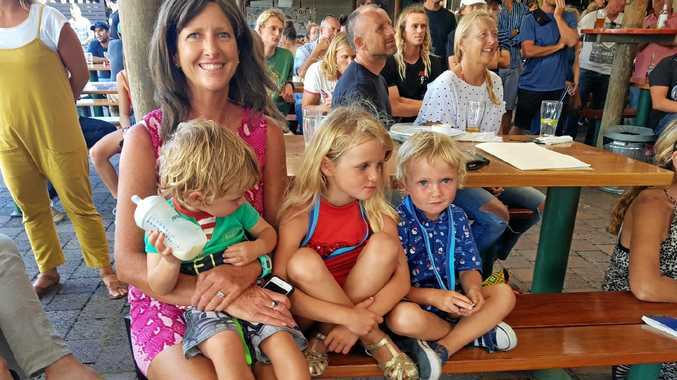 Bella's "mother", 10-year-old Lara Urwin, wanted to join her nine-month-old pets in holy matrimony because they had both joined the family when they were "really little and they were going to spend their lives together". Mum Megan threw her hands in the air and said, "I don't care if you want to marry the dogs as long as it's not going to cost me anything". 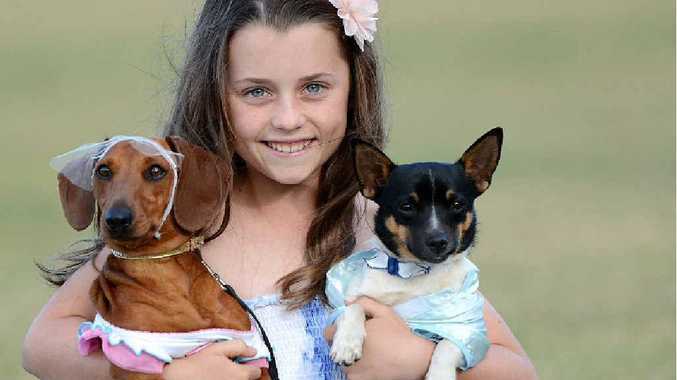 Lara's best friends, Lily Bromilow, Allie Salter, Ivy Dugdale and Lillie Crumblin, were the flower girls and bridesmaids, bringing wedding gifts which included chewy toys and liver treats. "Is it wishing well or gift registry?" one of the attendant's mum's asked before the big day, tongue firmly in cheek. Once the couple was pronounced husband and wife, the guests retired inside to partake of the wedding cake while the newlyweds stayed outside to chew on their gifts. Perhaps unfortunately, there will be no honeymoon nor the pitter patter of little paws, as Archie has another date with destiny soon - the big snip. But the future looks bright for this canine couple who appear to be enjoying the proverbial "dog's life". And the Mother of the Bride says she could not have been happier with how the big day went off. THE CEREMONY: Flowergirls Allie Salter and Lily Bromilow throw petals.